Visit https://developers.facebook.com/apps. You'll be able to log in with your normal Facebook credentials. (You must sign in with a Facebook account that is an administrator of the designated Facebook Page). 1) Click the green '+ Add a New App' button from the top right-hand corner. Then choose the 'Website' button at the far right. 2) Instead of using the "Quick Start" wizard that Facebook launches (which gets confusing), click on the 'Skip and Create App ID' button at the top right. 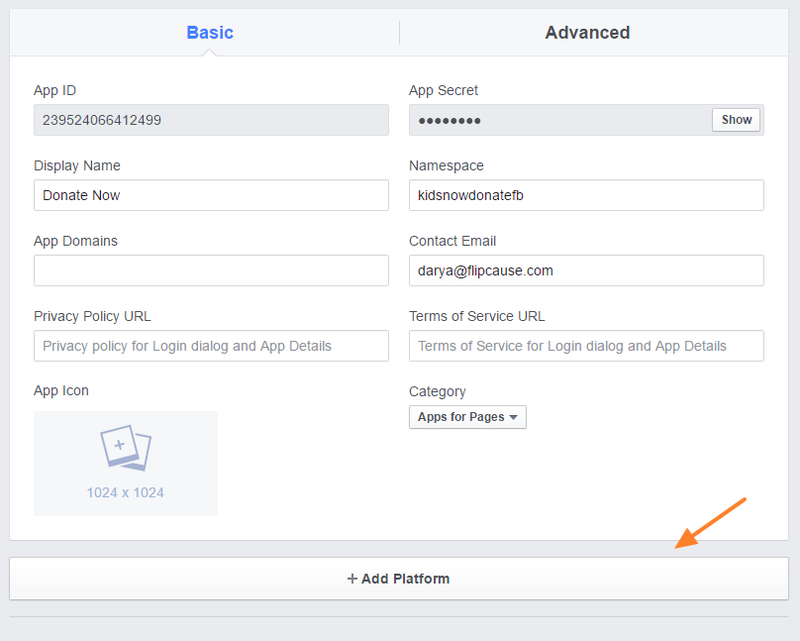 3) Here, you'll need to provide a 'Display Name,' which is what your "app," or tab, will be displayed as on your Facebook Page. You can also create a 'Namespace,' which is basically just a unique ID for your app -- although this is not required, and you're welcome to leave it blank. For example, for Display Name choose “Donate” and for Namespace choose “[Name of your org] Donation”. Select 'No' for the question about test versions. Be sure to add a contact email (otherwise your Donate tab won’t be visible to the public!). 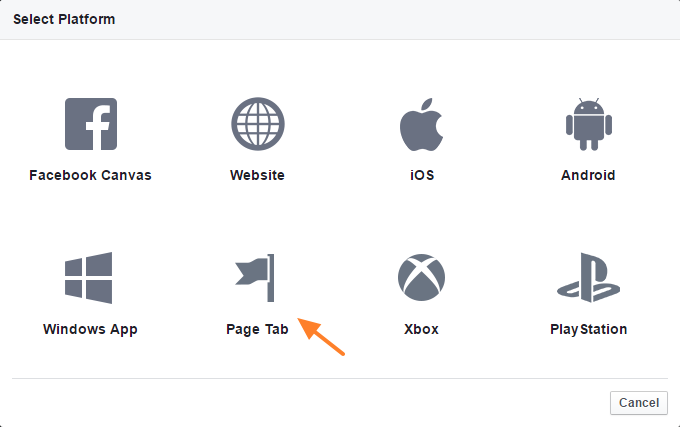 Lastly, choose 'Apps for Pages' as the category, since you're creating this app as a custom tab for your Facebook Page. 1) Once in your App Dashboard, click 'Settings' in the left-hand navigation. 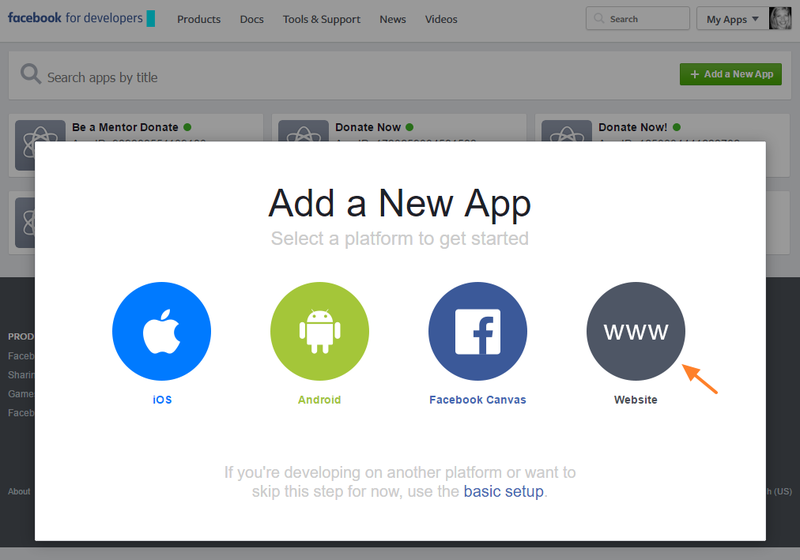 Then click the '+ Add Platform' button to start configuring your Facebook Page tab. 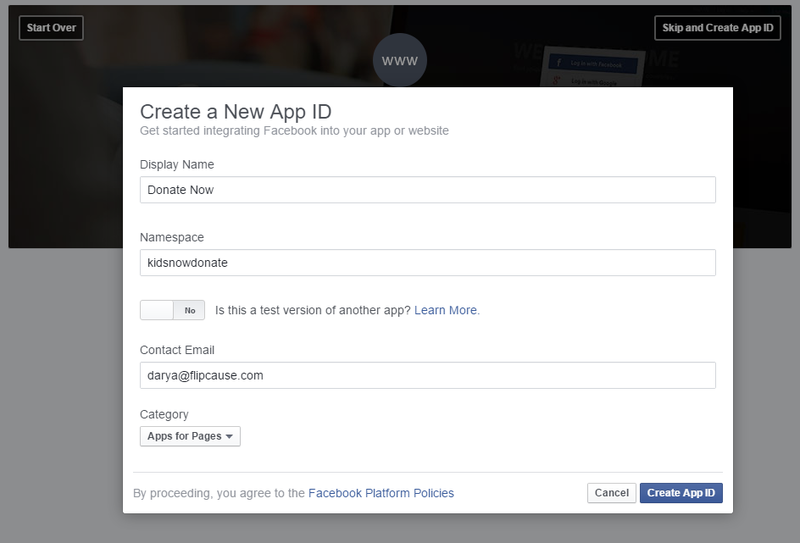 2) When prompted, select 'Page Tab' as your platform. 3) Next, add the 'Secure URL’ of your Integrated Campaign for Donations (find this by going to your Flipcause Dashboard > Integration Center > Campaign > select desired campaign > Grab ULS option > select the Integrated Campaign URL). Leave the 'Page Admin Control' toggle On and the 'Wide Page Tab' toggle Yes. You can also upload a 'Page Tab Image' here (which must be 111 x 74 pixels). 4) When you're done editing the contents of this section, click the blue 'Save Changes' button at the bottom right. 5) Click on 'App Review,' on the left-hand navigation menu and make sure to toggle to Yes and click 'Confirm' to make this app public! 3) Last but not least, select the Facebook Page you want to add your tab to by clicking on the 'Facebook Pages' drop down menu. Then click 'Add Page Tab.' Keep in mind that you'll need to be an administrator of the Facebook Page in order to add the tab. Voila! 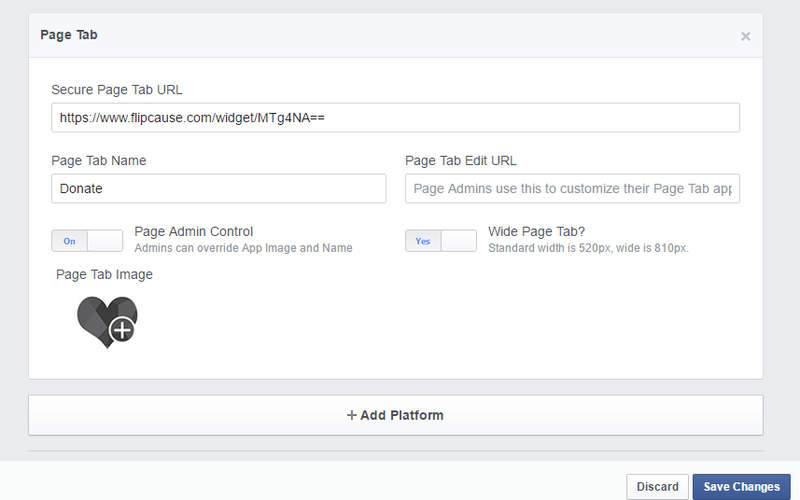 Your custom Facebook tab should now be added to your page. Go check and see! Because Facebook only allows you to display four tabs before the rest get bucketed under the 'More' dropdown, you can also rearrange the order of your tabs so your new custom tab appears more prominently in the main navigation of your page rather than in the 'More' dropdown. To rearrange your tabs, click 'Manage Tabs' in the 'More' drop-down menu on your Facebook Page, and then drag and drop your tabs in the order you want them to appear. Just note that 'Timeline' and 'About' must appear first no matter what.